Biodiversity is an irreplaceable resource therefore its extinction is always for ever. This is the reason, patenting of biodiversity of any region is being permitted nowadays under Intellectual Property Rights (IPR) to curb the genetic piracy as biodiversity originates at the molecular level and DNA, the only living molecule is the first level of biodiversity. It is the index of variety of nature and comprises every form of life, from the tiniest microbes to the mightiest beasts and gigantic trees. It exists at gene, organism and ecosystem levels. In the present book, various dimensions of biodiversity, viz. historical, ethno-medico-botanical, socio-economical, cultural, structural, legal, conservational and gender related etc. have been discussed by various experts of different fields. Status of biological diversity in forests, wetlands, croplands and specialized areas like the floating grasslands of Manipur, National Parks, Wildlife Sanctuaries, agrestal and ruderal sites and other protected areas has been described at length. Thus, the book will be equally useful to specialists , teachers, students, planners , policy makers, administrators and commoners. 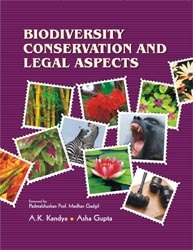 It gives a good insight of several aspects of biodiversity exemplifying various natural phenomena of NE Indian regions.